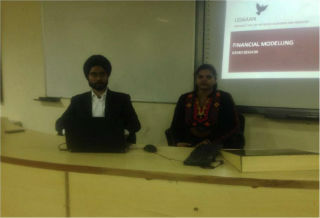 InvestoFin - Finance Club of JIMS organised an introductory session on “Financial Modelling ” on 4th February 2016. The session was specifically conducted for the students of PGDM–General who are planning to opt for finance specialization in second year. The session was conducted by Mr. Kirandeep Singh, Co-founder, Udaaan - an initiative by alumni from IITs to bridge the gap between the industry and the academia. 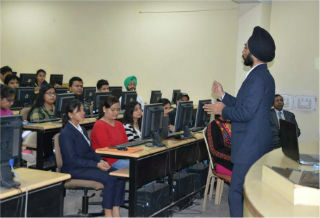 The session aimed at imparting financial modelling skills (on MS Excel platform) to the students which are indispensable in the financial services and banking industry. These skills form the building blocks for the corporate banking, investment banking, financial advisory services, equity research, credit rating agencies and other related job profiles. 45 students registered themselves two days prior to the session and showed active participation. The session started with an introduction to the importance of the financial modelling in various areas of finance. Then the discussion moved on to different types of finance job profiles in which financial modelling helps a student in building his/her career. 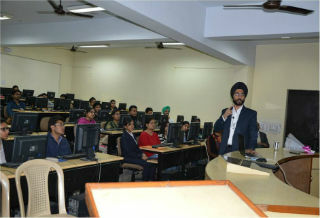 Mr. Singh used practical illustration of the models to make the students aware about financial modelling. Later on, various caselets were taken to develop the model in the real time. Students simultaneously were making the model on their computer systems in lab and interacted well during the sessions. Overall, the session was very well appreciated by all students.